Traveling to Japan for the first time can be overwhelming. I understand! There's a lot to see and do. That's why I put together a "first-timers" Japan travel itinerary, built on my 20+ years of traveling to and from Japan. This sample trip is for people heading to Japan for 1 to 2 weeks (which seems like the standard visit time for most people). Of course, there are so many things to see in Japan besides those featured on this trip itinerary. That's why I broke the travel plan into a 2 week stint so you can customize your vacation, removing and adding things as necessary. That said, I hope this is helpful to those of you visiting Japan for the first time. Whether you travel to Japan for one week or one-point-five weeks or two weeks, the general route stays the same. You'll do Tokyo area, then Kyoto, then Nara, then Koya, and then back to Tokyo. Throughout the route, I'll mark things as "optional" as well. If you're only staying a week, I'd recommend cutting out these things (unless you really want to go to them, then cut something else out). If you're staying for two weeks, you should be able to go to all of these places, and maybe even diverge off to other places. In fact, I highly encourage this! Go where you want – this route is merely a suggestion. Also keep in mind that I'm just going to be providing locations. You'll have to do your own research as to how to get to them. Google and Google Maps helps a lot with this. I believe in you. Whether you stay a week or two weeks, I'd recommend getting the JR Pass. This is like a magical golden ticket that gives you unlimited JR train rides (bullet train too) to anywhere around Japan. Not all things are free (for example, non JR trains as well as most subways), but if you take three rides on the Shinkansen that will usually make it worthwhile. You can get a JR Pass at jrpass.com (where I got my last one). Just be sure to take into account the time change when you schedule your ticket dates. Going to Japan involves traveling through both space and time. I don't really cover places to stay in this article, just the places to go to. Finding someplace to stay is up to you, though there are plenty of resources out there that will help you. I recommend hostels for adventurers / students / people with no money (they're fun, cheap, and way less sketchy than other hostels I've been to). Guest houses are also great if you can find them. They tend to be a little cheaper than hotels, but the food / environments are a lot more interesting. And interesting is what you want when you travel to Japan. Since this is a pretty standard trip, most of the places are going to be pretty bag friendly. I wouldn't bring a ton (lots of hotels have washing machines too), and would definitely recommend a backpack or something with wheels. Don't make the mistake of bringing something you're not comfortable carrying up and down long flights of stairs. You will run into a lot of these getting on and off trains, so if your biceps are tiny, only pack whatever you can lift (preferably less). Also, bring a lightweight duffel bag (or you can buy one) for the optional shopping you can do at the end of your trip. That being said, let's get started! You have some traveling to plan. Flying into Tokyo isn't terrible, but it isn't great either. 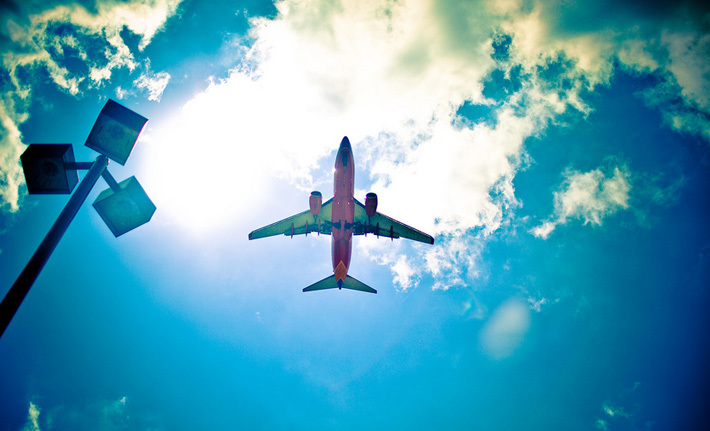 Depending on where you're coming from, you may also be terribly jet lagged. If that's you and you're on the 2-week schedule, you get an extra day to take it easy in Tokyo. Nice. If that's not you, you better be ready to go. No rest for the weary. After getting to the airport, you'll need to go pick up your JR Pass (should be included with your ticket). If your flight comes in too late (and the ticket place is closed) I'd recommend shelling out the $30 or so to go into Tokyo without the JR Pass and get it the next day in the city. Optional: You can also pick up a 3g hotspot / internet dongle for your computer if you'd like. Finding free wifi in Japan is a huge pain, and getting one of these will pay for itself if you need to do a lot of work, or something. 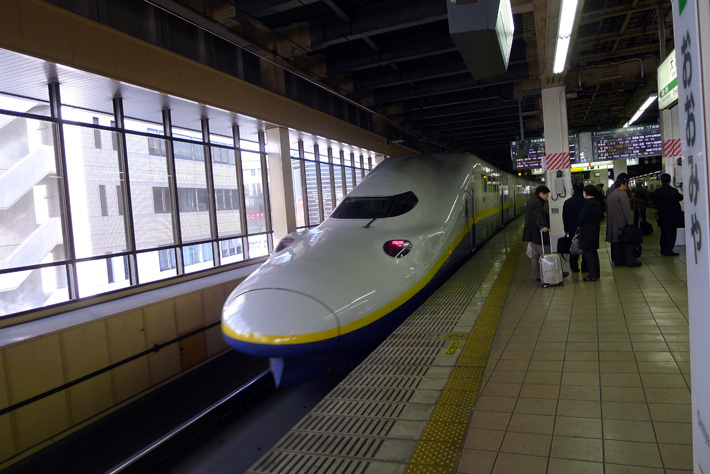 Once you've gotten your ticket, hop on the JR Narita Express (NEX) to Tokyo. When you get to Tokyo, check into wherever you're staying and scope things out. It's probably evening by now anyways, so do your best to unjetlag yourself and go to bed so you can wake up early. For the first few days, you'll be exploring Tokyo. So many people. So many things. Hopefully by the end of your Tokyo time you'll feel so tired of it you want to go somewhere nice and peaceful (don't worry, you will!). There are various areas of Tokyo worth visiting, and they're all quite easy to get to via the subway system. As long as you're not hitting it during rush hour, you'll probably have a great time scooting around. Since there are so many different tastes out there, I thought I'd list out the main places worth visiting in Tokyo, and then you can pick and choose what you like. I'll even sort them by areas. 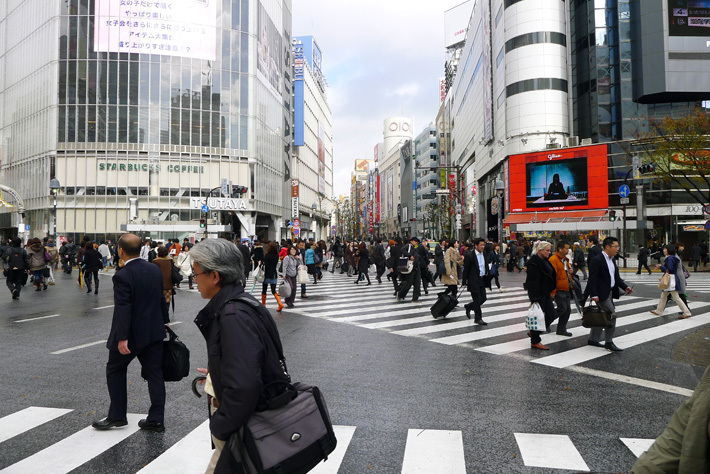 Akihabara: This area should be on every nerd's Japan itinerary. It's famous for its electronic shops and otaku culture. So, if you're into either of these, this is a fun place to be. Make sure you look up, too. Lots of multi-story buildings filled with all kinds of weird things. You can spend a while walking around here. Asakusa: Asakusa has the feeling of an "old" Tokyo, I think. You can visit the Sensoji (famous Buddhist Temple) and Asakusa Shrine or hit up some of the various shopping lanes. Ueno Park: Ueno Park is probably one of Japan's most well known parks. Besides being parkish, it's full of museums, shrines, temples, as well as the Ueno Zoo. Definitely the kind of place you fancier folks will enjoy. You can spend a whole day here, if you're into this kind of thing. Roppongi Hills: Want to see Tokyo from somewhere up high? Come to Roppongi Hills. You can go up into the Mori tower and look down on all those tiny people. Pro Tip: They don't like it when you try to throw pennies off the observation deck. Also worth noting is the Mori Art Museum. Kappabashi: Do you know how a lot of Japanese food places have fake foods outside showing you what the food looks like? There's a chance they got it at Kappabashi, the kitchen capital of Tokyo. You can buy things for your restaurant, but the best part is the fake food, I think. It's surprisingly expensive, too. Shibuya: Shibuya is just a ward of Tokyo, but it's particularly known for all its fashion and culture. Fashionistas should put it on their Japan itinerary. A lot of shopping can be found here, but there's also the Hachiko Dog Statue as well. Scope it out but come back in the "shopping days" at the end of your trip. Love Hotel Hill: Technically this is part of Shibuya, but it's worth noting on its own. This is just an area with a lot of love hotels. Pro tip: They won't let three people in at a time, so if you want to check one out as a group, you'll have to break up into pairs or bring a body pillow. Shinjuku: Shinjuku's kind of the party district, though that may be because of Kabukicho (northeast of Shinjuku Station) which is Tokyo's big red light district. If you're into nightclubs, bars, pachinko, neon, and other ahem things, this will be a place you'll enjoy. Harajuku: Love crazy outfits? You'll fit in right here. Harajuku is home to Tokyo's teen fashion and cosplay (if you visit on a Sunday). There's also plenty of shopping and crepe stands as well (yum). Meiji Shrine & Yoyogi Park: These two places are pretty close to each other, so I'm putting them together here too. It's also a good place to go from Harajuku, since you'll use the same train station. The Meiji Shrine is just one of many shrines in Japan, but it's particularly interesting if you're into modern Japanese history. Yoyogi Park, on the other hand, is just a really big park. Both are nice, though, if you're looking to get out of the cement jungle known as Tokyo. 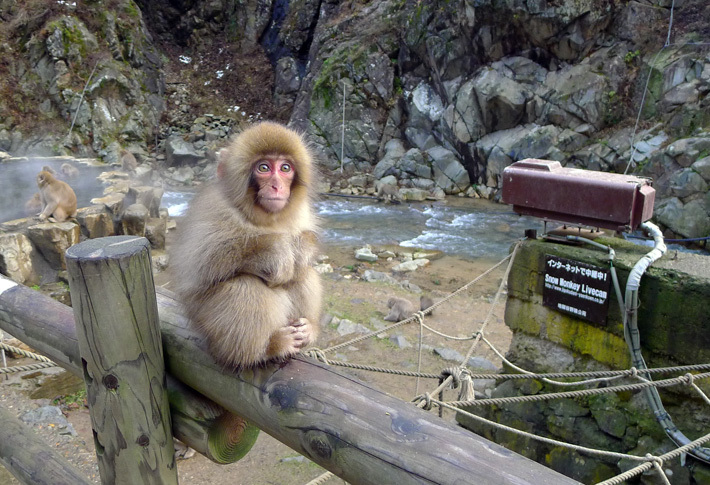 Have you heard of those Japanese monkeys that hang out in the hot springs? This is one of those places, though depending on the time of year, they may not be spending too much time in the hot springs. I like this place in Winter, but other times are good as well. Summer means baby monkeys, after all. To get here, you'll have to go North of Tokyo to Nagano (Shinkansen it!). From Nagano Station, take Nagano Dentetsu to Yudanaka. From there, you can take a bus to the Kanbayashi Onsen, which has the entrance to the Jigokudani Yaen-Koen. It'll be a 30+ minute walk (depending on how much you stop) to get to the actual monkey area, though you may start seeing monkeys before then if you're lucky. Check out the livecam, too! If you're going to Jigokudani, I'd maybe recommend heading up here at the end of Day 4 and staying the night in Nagano. There's some interesting things up there too (that's where they did the Winter Olympics in 1998! ), so feel free to head up a bit earlier and check things out. Then, the next morning (Day 5) you can head out bright and early to Jigokudani and take your time with the monkeys and possibly hit the onsen. It's a nice place. Then, you can head on back to Tokyo the same night. Nikko is the mausoleum for Tokugawa Ieyasu. Basically, he and his relatives ruled over Japan as Shogun for 250 years (until the Meiji Restoration). That means he got a pretty sweet shrine. There are over a dozen Shinto and Buddhist buildings here, and it's in a very beautiful setting. Need some peace from Tokyo? You'll for sure get it here. This can be a day trip (it's really close to Tokyo) with some extra time left over. I'd recommend coming here, then either checking out other things in this area or heading straight to Tokyo in the afternoon or evening. Just be sure to give yourself 3-4 hours to travel, so don't leave too late from here. Another option would be to leave the morning of Day 7 and get to Kyoto in the late morning or early afternoon. It's totally up to you. *If you're on the 1-week plan, skip day 8 and go to Nara instead. Kyoto's going to be your shrine and temple time while visiting Japan. Since it was the place where the emperor lived for over a thousand years, it's full of cool, historical things. Take your pick and enjoy. Also be sure to just walk around at random. You'll run into so many temple, castles, and shrines just by accident. It doesn't hurt to explore, some. Oh, and bring your walking shoes. Things are about to get… walky. Nijo Castle: This was where Tokugawa Ieyasu lived (remember his shrine, up above?). Later it switched to an imperial palace (after the Shogunate went down), and then later opened to the public. It is a UNESCO World Heritage Site, which is supposedly a big deal. Kyoto Imperial Palace: When the Shogunate was in power, this is where the imperial family lived. You can even take tours in English, here. Kinkakuji: Also known as the golden pavilion, this is a building covered in gold. Kokedera: Also known as Saihoji, this is another UNESCO World Heritage Site (way to go, Kyoto). This temple is mainly known for its moss, and apparently has over 120 different varieties. Fushimi Inari Shrine: This shrine is known for its thousand torii gates. They're bright orange and absolutely incredible to walk through. Highly recommended. 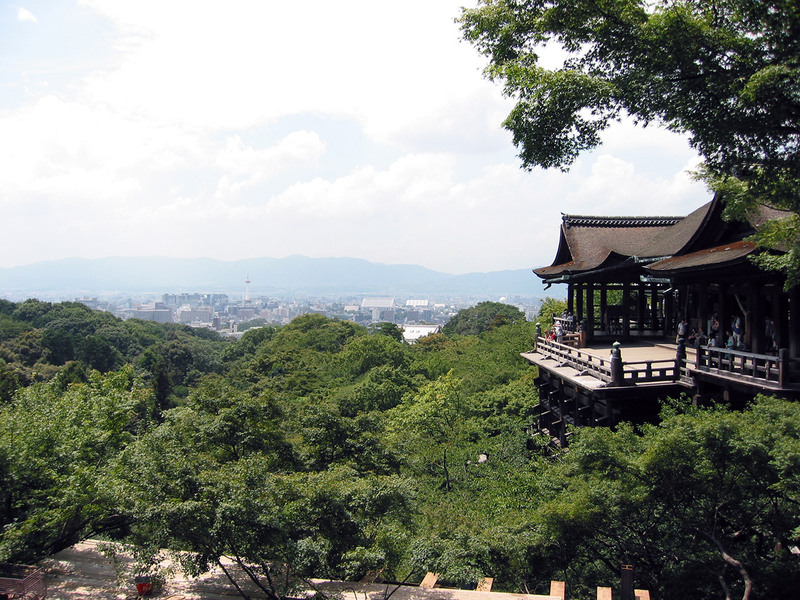 Kiyomizudera: One of the must sees, I think (and also a UNESCO World Heritage Site). This temple is high up on a hill and has a balcony that offers an awesome view. Higashiyama District: You'll run into this on your way up to Kiyomizudera, actually. Think of this area as a "historic shopping district." Kind of touristy, but a lot of fun nonetheless. Grab something to take home! Sanjusangendo: The building itself it's amazing, but the inside is pretty remarkable. 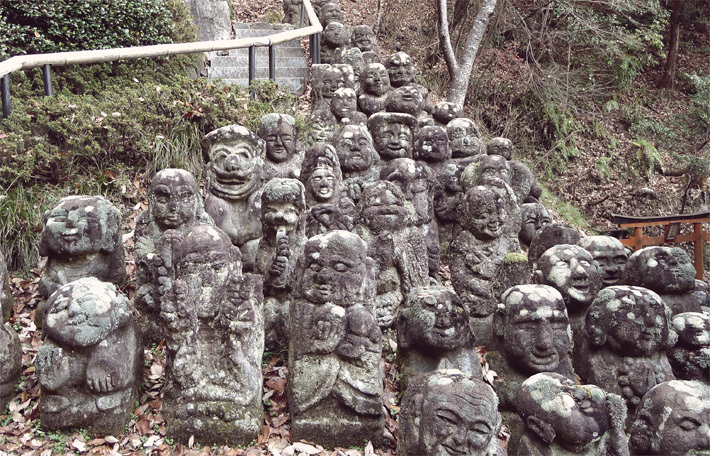 There are 1001 statues of Kannon in here, which is… well… kinda remarkable. Gion: Like Geisha? this is Kyoto's Geisha District. You will have to try pretty hard to get in to see a geiko, though, but good luck trying (hint: apparently some travel agencies will hook you up if you've got the yen). You can leave the morning of Day 9 or leave the evening of Day 10 and spend the night in Nara. Either is fine. You can even spend the night in Nara on Day 9 as well then move on early in the morning of Day 10. It all depends on how much you like temples and Deer. 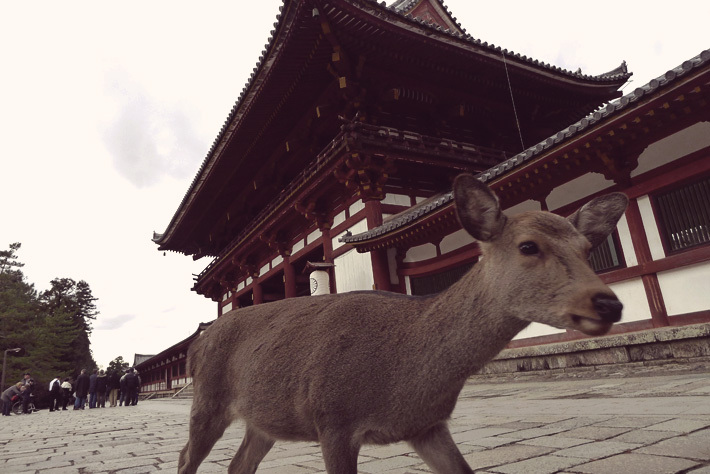 While there's some neat temples, shrines, castles, and other similar things here in Nara, I'd say you're coming for deer. The deer here are pretty tame and will actually attack you if you have food (kinda fun to run from deer). Don't worry, they have their horns cut off, though (it's a religious thing), so you won't be stabbed through, most likely. Todaiji Temple: Largest wooden structure in the world with Japan's largest Buddha statues inside. Basically, think super sized. Definitely one of the best places to visit in Nara. Nara Park: Has a lot of deer. Go buy deer food, the deer will thank you. Kofukuji Temple: Basically a big temple. Very pretty, though. Nara National Museum: If you're interested in Japanese Buddhist Art, this will be a fun place for you. The building is also surrounded by ferocious, wild deer. Consider this a day to walk around but not as much as when you were in Kyoto. Nara's a lot like Kyoto in a lot of ways, though, so I'd recommend mainly hitting up the deer and then hitting up Todaiji Temple. Depending on how worn out you are on temples, though, you can stay here longer or shorter, deciding where you stay this night based off of that. You'll want to make sure you leave early this day, whether you're leaving from Kyoto or Nara. You have a ways to go to get to Koya-san, quite possibly one of the most beautiful places in Japan (just my opinion). This might be one of the best places you go in your Japan travels. There are a hundred temples here, many of which you can stay the night at. When you spend the night, you get the best vegetarian meal you've ever had (guaranteed), a room to stay in, and even the option to wake up (really) early to go watch the monks do their morning rituals. It's so peaceful, a lot of fun, and one of my favorite places on earth. 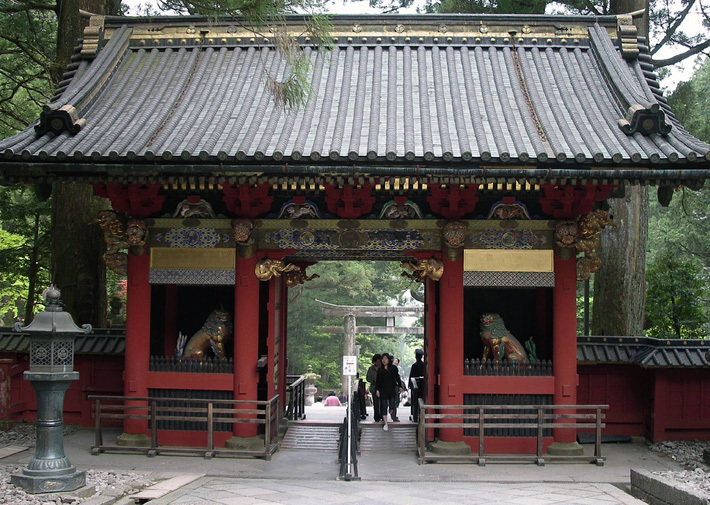 You'll want to go to the Koyasan website for more information on lodging. I'd recommend getting here as early as you can on Day 10, dropping off your things at the place you're staying, then just walk around. You'll be able to fill a good amount of time just exploring. The best place to walk, though? Probably the giant cemetery, which also happens to be the largest in Japan. Although some may find a graveyard creepy, it really is quite peaceful. This, I think, will be one of your best days in Japan, so don't skimp out on it if possible! Just be sure to get back to your temple in time for dinner. *If you're on the 1-week schedule, you'll need to get back to Tokyo. You're running out of days. Day 11 is mostly travel. You'll want to leave Koya either late morning or early afternoon, depending on where you're going next. 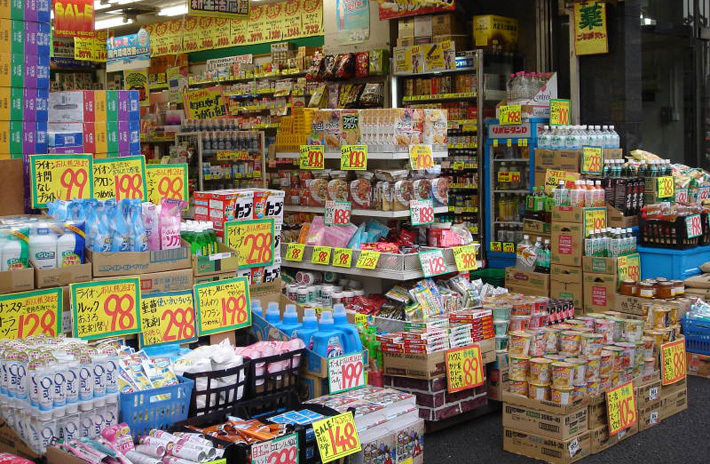 If you like shopping a lot, you'll want to get back to Tokyo on this day. If you don't need the extra time, consider stopping in Osaka (it's on the way from Koyasan). You can visit the Glico Man, Osaka Tower, play some Pachinko, and eat some Takoyaki / Okonomiyaki (both famous in Osaka). It's a bit different than Tokyo, but it's still a big city. I'll leave this one up to you, though. Osaka's a lot of fun to just walk around and check out. Alternatively, you could stop at Mt. Fuji on the way back too. I recommend the amusement park Fuji-Q Highland over climbing the mountain itself (it looks better from afar, you'll have to trust me on this one) if you do this. Definitely don't miss the horror house there, it's top notch. Whatever you end up doing, you're reaching the end of your trip. Just make sure you're back in Tokyo in time to do your shopping before you get on the airplane to leave. Of course, if you don't shop, then you have more time to go to more places. If you do shop, get back to Tokyo. Hopefully you scoped out all the places you wanted to shop at, because this is your shopping time. Get the things you want for yourself and for your friends / relatives. Fill up that duffel bag you brought / bought and have fun. This is also a good time to just go around to the places you missed. Either way, it's good to be back in Tokyo a day or two before your flight leaves, that way you won't miss your flight (unless you want to "accidentally" miss it, wink wink nudge nudge). Hope you had traveling to Japan. This is only your first trip, though. Now that you've gotten all the normal / main stuff out of the way, your next trip can be filled with strange, exciting places. Be sure to check out TofuguTV for some of those, and keep reading Tofugu for more in the future. There are certainly many, many "off-the-beaten-track" locations worth visiting, but we'll save that for next time!